If you received this error with QuickBooks desktop it is most likely a permissions error with the user. For QuickBooks Desktop to work with Buddy Punch you'll need to be signed into QuickBooks Desktop as the main account holder. 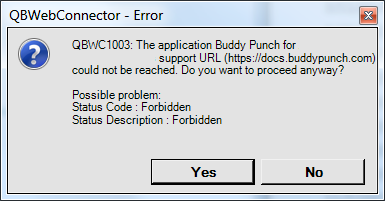 If you are signed in as a different user that has admin rights it will not work, as QuickBooks requires the main company holder to install the WebConnector that links Buddy Punch and QuickBooks together. You'll need to uninstall the web connector, then sign in as the QuickBooks main account holder and reinstall the web connector for it to work.